“It changed me so much”, she said while we waited for our dinner served in a cozy tavern in Split. Spontaneously she and me decided to spend the evening together although we just met a couple of hours ago in the common room of a Croatian hostel. “You’re right”, I responded well knowing what would follow. Perfectly in time, the waiter walked towards us with our orders, placed them on the table and poured some white wine in our glasses. “Dobar tek!” He wished us a good meal and left. Taking the first bite, the Canadian girl started to tell me the story behind her knotted, white bracelet. The Mediterranean salad was delicious. We raised our glasses in a toast to this wonderful summer night in good company. Some candles on the big table softly lit the surroundings. “Shall we order some more wine”, she asked and waived over the waiter. We agreed and our glasses got refilled with the sweet grape liquor. After she took a sip, she shared her story in such a captivating way that I didn’t dare to interrupt her. In Slovenia I met this girl, Hanna. Her whole arm was full of bracelets in all colors and shapes. None was the same. They were all unique in their appearance – simple, braided, or knotted with a very difficult technique. Apart from her cheerfully covered arms, her whole personality was similarly cheerful and welcoming. “Pick one bracelet”, she said, pointing at her left arm. Intuitively I chose a blue bracelet with plaited red glass pearls. “Good choice”, she replied smiling. “I’ll tell you the story behind. It starts with my much older brother. One day he was gathering our complete family in the living room, including my grandparents, to make an announcement. Everybody was confused as Tomas, my brother, is a very calm person but in this moment while he stood in front of us, he seemed like changed. His eyes were glowing. “Tomorrow I’m going to leave”, he explained the reason for the gathering. Our jaws dropped. None of us could believe what he has just told us. My mother was the first who tried to find appropriate words to clarify the situation. “Where are you planning to go?”, she asked a little bit scared. “I don’t know yet”, Tomas responded without losing his strong attitude. My mother asked him what he was planning to do in Greece. “Do you remember Paulo?”, Tomas asked. While my mother shook her head, I blurted out: “I remember him. You mean Paulo from this Greek island who was here last summer. He hitchhiked all his way up to our country and you brought him home for dinner. We sat together in the garden, listening to his adventurous stories on the road and learning about his culture. He made the beginner’s mistake to underestimate rakija what ended with him staying over night.” A broad grin spread across my face memorizing Paulo’s headache the next day. It clicked! My mother and all the other family members started to remember the funny guy with the black curly hair. While my mother was still rejecting what Tomas was about to do and that was traveling, the rest of the family felt proud of him. Especially me. I was fascinated by his courage to do the same what Paulo did. Hitchhiking all his way up to Greece without knowing when he would arrive and what would happen in-between. We calmed our mother down and reassured her that Tomas is a smart young guy who knows how to protect himself. To cross the national border, was a horrible image for my mother as she still had the outdated idea of the Balkan hostilities in her head. My brother wanted to make a step out of his comfort zone. At the same time, it made me reflect about my own life. The idea of following my brother’s and Paulo’s way one day, was born. When Paulo left to continue his journey, he came over to our house to say goodbye. I was the only one home. I looked at the item he put in my hands. It was a blue bracelet with red pearls. I took it and tied it around my wrist. It was my first bracelet given by a stranger. Excuse me, not a stranger – a traveler. Whenever I look at the bracelet, I feel reminded of Paulo and his story. The Canadian girl paused her talk, running her hand over the white bracelet. I begged her to reveal the end of her inspiring story. She smiled and responded: “We waited together at the train station as I was about to leave Slovenia to continue to Croatia. Before I got on the train, Hanna gave me this white knotted bracelet as a memory of our encounter. “Continue our tradition”, she said while waving goodbye. Afterwards, we remained in the cozy tavern for another while, eating our dinner, drinking the wine. When we finished, we went outside for a walk to the marina where we enjoyed the view over the sea, lit up by the moon. Suddenly she untied a yellow bracelet. It was not the bracelet from the story but instead one of her own. Indeed, the story of her brother and Paulo was also part of her own story. Only a few months later, the Slovenian girl started to travel herself. Mika, my new Canadian travel friend handed the yellow bracelet over to me. “It changed me so much”, she repeated her words. I tied the bracelet she gave me to my wrist, knowing that now it’s my turn to continue the tradition. The unwritten tradition of all travelers around the world. I told you the story of Paulo, Tomas, Hanna, Mika and in the end the story of myself. Paulo gave Hanna a blue bracelet. Hanna gave Mika a white bracelet. Mika gave me a yellow bracelet. Not any bracelets – special ones. 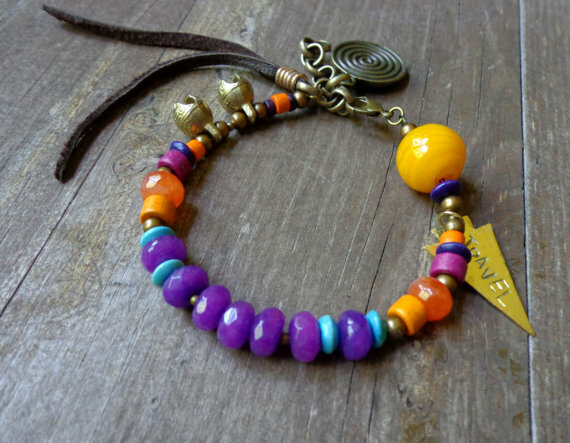 If you see travelers, you’ll easily recognize them by their bracelet-filled arms. A bracelet is a symbol of belonging to a circle of people from different nations and cultures who are united by their insatiable hunger for traveling the world and passing on valuable lessons and sparkling stories. 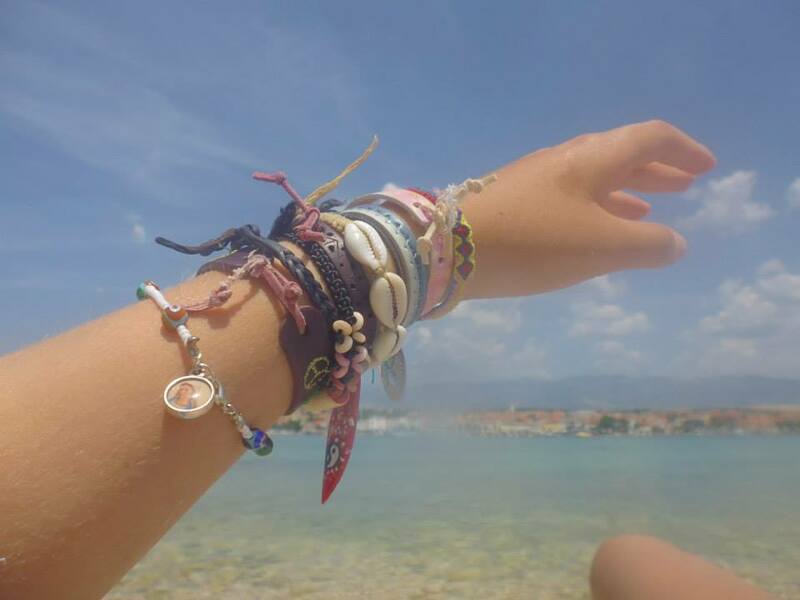 I collect bracelets I bought in the places I visited or that were given to me by travel mates. By telling my stories and passing on bracelets, I give away a part of myself. My adventures, experiences, encounters and dreams. By keeping the unwritten tradition of wanderers, no matter which language they speak or which culture they belong to, we create a universal code of understanding each other.